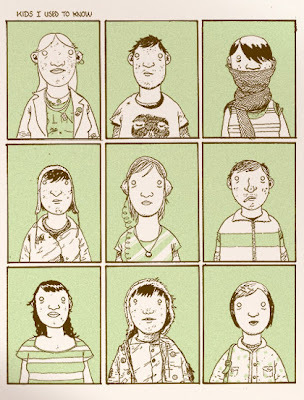 this print reminds me of the kids i used to know (i'd totally be the one on the bottom, far right. the resemblance is scary). i've been reminiscing a lot about high school days (and have decided i'd love to read the notes that he'd tie to the chain link fence again. where oh where is that shoebox?!). this is an ode to my creative writing class: where the goths, the cheer squad and the coffee bean kids unite. a place we all felt comfortable writing our guts out. whether or not it was any good. cool artwork by reddingk. this bunny print is super rad too. hey, i was in that class! i wish i knew where i put my creative writing notebook. that class was awesome...very random people indeed.